Alexis looks like a Russian Princess - definitely a Winter Wonderland girl. 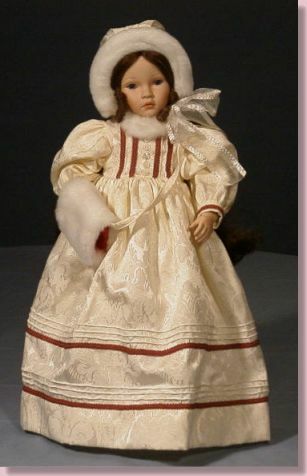 Alexis, a sweet Victorian child, is dressed in a stunning ivory brocade dress exquisitely detailed with old rose braid and delicate pintucking. 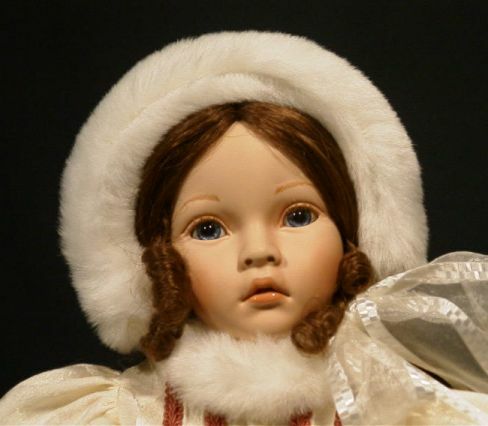 She wears a gorgeous bonnet trimmed with white fur and carries a beautiful muff wherever she goes. Alexis has blue eyes and brown hair with tiny curls framing her darling features. Alexis is crafted of fine hand-painted porcelain and is an individually hand-numbered Worldwide Limited Edition of 950 pcs.